A new paper out this week in the BMJ reveals how the tobacco industry applied their marketing tactics to sugar sweetened beverages and turned generations of children into customers. Nguyen Kim H, Glantz Stanton A, Palmer Casey N, Schmidt Laura A. Tobacco industry involvement in children’s sugary drinks market BMJ 2019; 364 :l736. Kim H Nguyen of UCSF's Philip R Lee Institute for Health Policy Studies, and colleagues Laura Schmidt, Casey Palmer and Stanton Glantz dug into the Truth Tobacco Industry Documents to show that many of today’s leading children’s drink brands were once owned and developed by tobacco companies. 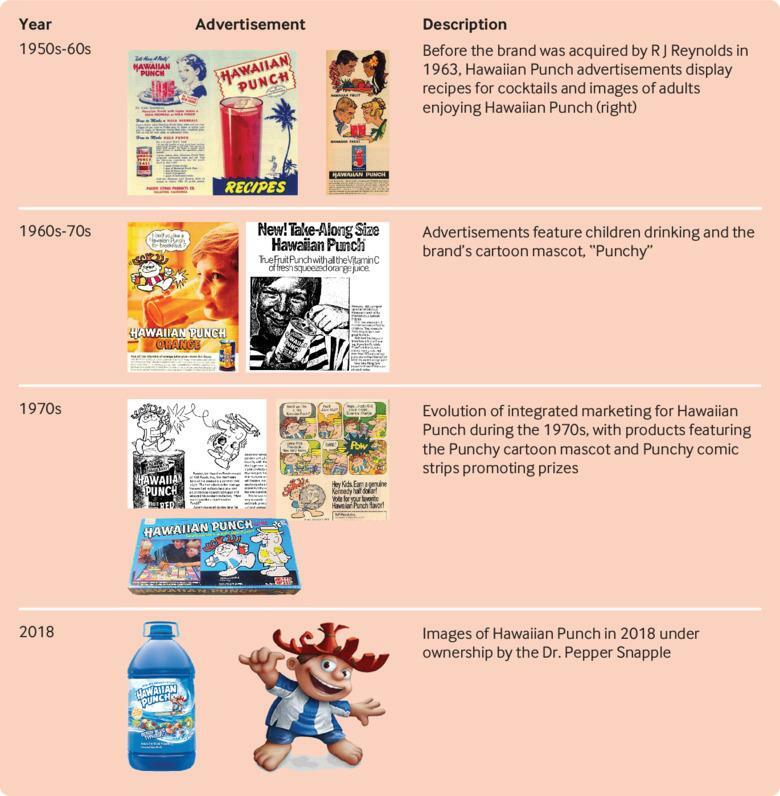 The tobacco companies initially acquired soft drink brands to diversify and documents show they applied marketing strategies aimed at kids (colors, flavors, cartoon characters) to promote and develop the brands. Although the brands have since been sold to food companies, the marketing techniques remain in use. It's been a busy month for our Food Industry Documents Archive! The New York Times Coca-Cola Collection contains 1700 documents with more to come. Donated by NYT journalist Anahad O'Connor, these documents shed light on the Coca Cola backed non-profit group Global Energy Balance Network (GEBN), an organization that aimed to promote physical activity instead of reduced sugar consumption as a solution to chronic disease and obesity. We are pleased to announce the addition of the PFAS Collection to our Chemical Industry Documents Archive. This initial set of internal documents, donated by the film team behind "The Devil We Know," discuss the toxicity of C8, pending litigation, and DuPont's messaging around the exposure levels found in the buildings and surrounding areas. We had a number of well-attended and compelling talks showcasing our Food Industry and Chemical Industry Archives last year. We now have the videos of these public events posted permanently under Public Lectures on our Research Tools tab. We hope to continue to provide these talks as new collections and industry archives are added. Maani Hessari,Ruskin, McKee & Stuckler. Public Meets Private: Conversations Between Coca-Cola and the CDC. Milbank Quarterly, 2019. Crosbie, Bialous, Glantz. Memoranda of understanding: a tobacco industry strategy to undermine illicit tobacco trade policies. Tobacco Control, 2019. A total of 4398 new documents were added to the Industry Documents Library this week! We are excited to announce 132 documents in our new USRTK Food Industry Collection. This new document set includes correspondence among the United States Centers for Disease Control (CDC), governmental health organizations, and the Coca-Cola Company. 4 new papers and publications have been added to the bibliography including articles on menthol's use in recruiting and retaining young smokers in Singapore, TTCs in Paraguay, and the tobacco industry's influence on policies in Oklahoma. On November 15th, the UCSF Industry Documents Library partnered with the UCSF Philip R. Lee Institute for Health Policy Studies in an event to launch the new Food Industry Documents Archive. The link to the recording is now available! The recording covers the full symposium and includes talks by author and NYU Professor Emerita Marion Nestle, UCSF faculty including Stan Glantz, Cristin Kearns, Kim Nguyen, and Laura Schmidt, and an introduction/walkthrough of the Food Industry Documents Archive. The UCSF Industry Documents Library (IDL) is pleased to announce the launch of the Food Industry Documents Archive, a brand new collection of over 30,000 documents related to the food industry and its impact on public health. These documents, now available online for the first time, highlight marketing, research, and policy strategies used by food companies and trade groups, and reveal the communications and connections between industry, academic, and regulatory organizations. The Food Industry Documents Archive was created in collaboration with the UCSF Philip R. Lee Institute for Health Policy Studies. Additional collections will be added over the next year. Topics include: the Sugar Research Foundation, the International Sugar Research Foundation, the Sugar Institute, cane and beet sugar production, sugar-sweetened beverages, sugared snack foods advertised to children, the U.S. Public Health Service, and the National Research Council Food and Nutrition Board.